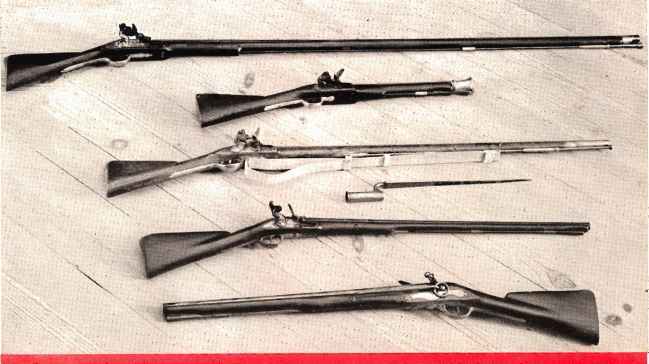 Old model stocks allow the gun to twist, and amplify recoil, but are the most compact. You can make your own with attractive wood, or you can buy plastic stocks. For hunting or plinking, you'll want the better-holding and recoil-absorbing target handles. Many firms supply good ones. S & W make a variety of plain and fancy wood target types for the "N" frames, as well as their Magna service type. Python stocks fit the Colt, by drilling new holes for the stock pin. You'll want an easily installed target sight for any use except close range defense work, on either full length or amputated tubes. The adjustable Metro-Ramp with a white, red, or black post fits over the front sight. The F.D.L. 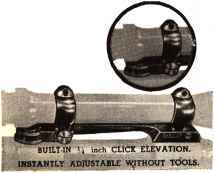 rear sight, adjustable for windage and elevation, attaches on a Smith without drilling. They attach on a Colt by drilling and tapping one hole. Colt guns weigh about 40 ounces, a Smith 4 ounces less. Colt barrels can be cut to any length. The lug on a Smith must be, minimum, 3". .45 C re-, factory, and .455 loads may all fit same chamber in redone gun. Rt., good dies will avoid case damage. compound such as Clover 4-A. I've seen many medicore tubes get hot when cut off and crowned, which is a good tip to remember. Front sights can be installed in a number of ways, but a slip-on ramp makes the nicest looking job. Lyman's .640" rifle ramp can be used without the bead, or make one for free from scrap. Ream a length of gun barrel to size, and weld on a blade before installing. Make the blade higher and wider than necessary, so you can file it down to center your groups. A finished V$" blade is about right, but many people have discovered they can aim faster and hit just as well with a wider blade. File the rear "U" notch square and wide enough to match your front sight. .45 ACP pills are generally sized .452, and .45 Colt .454. The smaller size gets erratic in the oversize .455 S & W that has grooves .457 to .458. But Smith's shoot well with .454 bullets in the .45 Colt case, if they are soft enough to upset in the bore. Colt's have standard grooves about .452 in the .455 or .45 Colt. Factory .45 Colt fodder has a max bullet diameter of .455. The British G.I. .455 pill is about .457, with a hollow base that expands to fill the grooves perfectly. Good as it sounds, it's ballistically inferior to good flat base pills. You lads with a .45 ACP mould and only .452 sizer dies may find these bullets work okay in Colt guns in the .45 Colt case. If they cast about .454, they are okay in a Smith without sizing. Place bullets in a shallow pan and melt enough lube to cover the grooves. Make a cake cutter by drilling out the head of a fired 45-70 case, and you are in business; or apply lube by hand. Most bullets shoot well, even if slightly imperfect. Soft bullets with a flat nose increase shocking power. This slow speed round doesn't depend so much on velocity for killing as on the bullet material, design and weight. The G.I. slug had the worst possible shape and material, with velocity hardly better than throwing rocks, yet it had good stopping power, due solely to the weight and caliber. The slow, slow speed has some slugging effect, entirely different to the explosive effect of modern Hi-V bullets. That's why mild, light-kicking loads are nearly as effective as stuff loaded to nearly the bursting point of the gun, which isn't a Hi-V number with any load. I'm a velocity fan, but no matter what paper ballistics indicate, there isn't a whale of a lot of difference in the stopping power of a big slug at 600 fps and the same pill at 870 fps, the velocity of .45 Colt factory fodder. Velocity isn't much of a factor unless the slug is soft enough to expand. Illinois Bullet Alloy No. 4 is excellent, and soft enough to fill the grooves of S & W guns with moderate loads. A good home mix is 1:20 tin and lead, that has more shock than a harder alloy. Anderol bullet lube, like their oil and grease, is a superb product. Sole U. S. Agents for the World's Finest... Anschutz, Francht. Krico, Llama, Mannlicher-Schoenauer, Sarasqueta and Sauer.